Many Universities and teaching institutions use either digital microscopes or teaching microscopes to facilitate the process of showing students the same image during instruction. Digital microscopes allow the instructor to project an image onto a screen so all students can view the same microscope slide. This is especially helpful when the class size is a bit larger. A teaching microscope however, can offer a bit of a different view point, in that the student can look through the microscope at the same time as the instructor. If the instructor wants to show the student the difference in an image while adjusting the condenser or changing lighting, the student can see exactly which parts of the microscope are being adjusted, while still viewing the microscopic image. 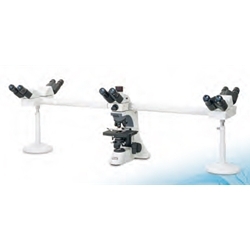 Teaching microscopes are available from two viewing heads, all the way up to ten viewing heads. 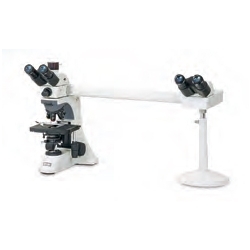 You can view more teaching microscopes here.